A terry towel is a textile product which is made with pile loops on one or both sides covering the entire ground surface or forming pile strips, pile checks, or other pile patterns (with hemming end or with firm selvedges). A terry towel is a textile product which is made with pile loops on one or both sides covering the entire ground surface or forming pile strips, pile checks, or other pile patterns (with hemming end or with firm selvedges). Turkish Toweling fabrics structures form a class of warp pile termed terry pile in which certain warp threads form loops or curls on the face of the cloth. We may use one weft and two series of warp threads placed on two warp beams are necessary for the production of this cloth. 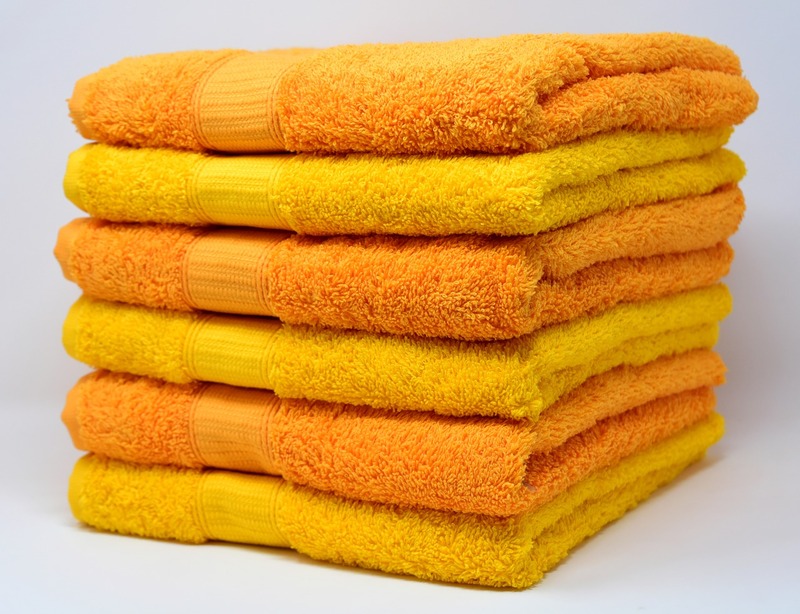 Cashmere Towels are made of Superior Ring Spun Quality Yarn. They are soft and luxurious and will provide a sense of comfort to your valued guests. Cashmere Towels are the best choice you will make by balancing luxury and cost. The invention of the towel is commonly associated with the city of Basra, Turkey in the 17th century. These Turkish towels began as a flat, woven piece of cotton or linen called a pestamel, often hand-embroidered. The name word terry came from French word tire which referred to pile loops which were initially pulled by hand Long enough to make it absorbent cloth and wrap around the body. These pestamel manufactured were originally fairly narrow, but now are wider and commonly measure 90 by 170 centimetres (35 in × 67 in). Pestamel were used in Turkish baths as they stayed light when wet and were very absorbent. Both open end and ring spun yarns can be used depending on designing parameters of terry towels. Normally three yarn components are used in manufacturing terry towels. Normal twisted yarn with normal twist factor for ground yarn, low twisted yarn with lower twist factor for pile yarn and low twist or normal twisted yarn for weft yarns. Single or double yarns are used for all or few yarn components again depending on how the product has been designed. To make towels more absorbent and soft, twist less cotton ring spun yarns are also used. For producing twistless yarn, cotton ring spun yarn with very low twist factor is covered with a water-soluble PVA filament yarn on yarn covering machine or is twisted on TFO machine the direction of double yarn twist is opposite to that of the single spun yarn twist, and the amount of twist factor is adjusted to normal twist required in the spun yarn. By this process, the PVA filament wrapped around the cotton yarn and the yarn was sufficiently strong due to the cohesion has given by the filament which makes it weave able and during finishing operations, the PVA yarn is dissolved in water.